Again, what a difference a day makes! 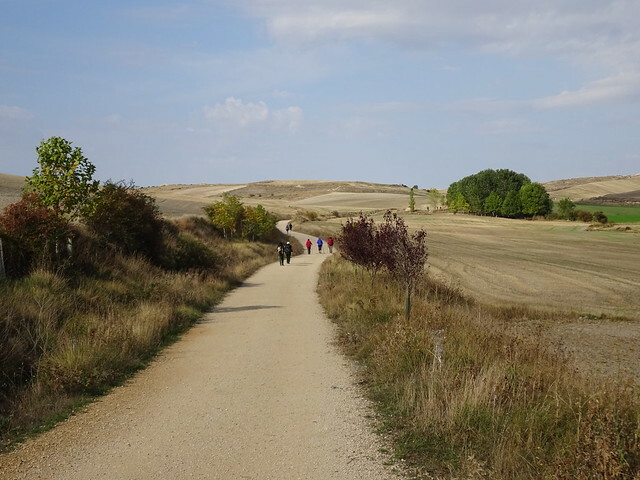 Today we exchanged the busy city streets of Burgos and the highways leading to it for the one-street village of Hornillos del Camino. On the way, the Camino is interrupted by construction areas where two new overpasses are being added to an interchange. Even the new construction hasn’t escaped the workings of graffitti artists. Finally after walking 11 km., we reached the small village of Tardajos where we were starving for a big breakfast. Dave’s two sandwiches, my potato tortilla, and our orange juice and cafe con leche disappeared as if by magic. This was the first cafe since leaving Burgos so it was a popular place for all the hungry peregrinos to stop. 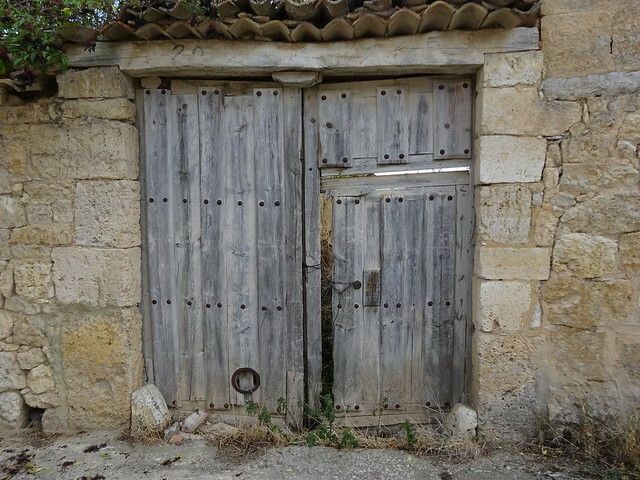 We crossed the highway, walked through the quiet back-roads of Tardajos and Rabe de las Calzados, and then finally left the built environment for the relative wilderness of the sublime Meseta. The Meseta is a largely treeless and windblown high plain where the natural earthen track crosses endless crop fields, all of which have been harvested or plowed at this time of year. 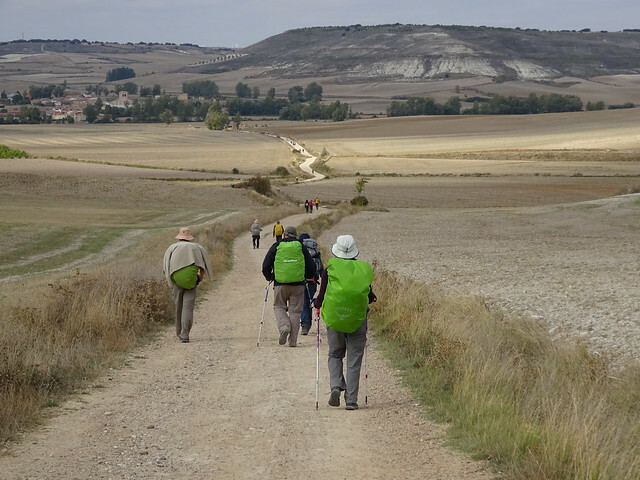 We’ll be walking on the Meseta for several days. We had seen a rainbow while en route to Tardajos, so we knew there was a possibility of rain. It started just as we finished breakfast and continued off and on for about an hour. Then it cleared up to a beautiful sunny day. 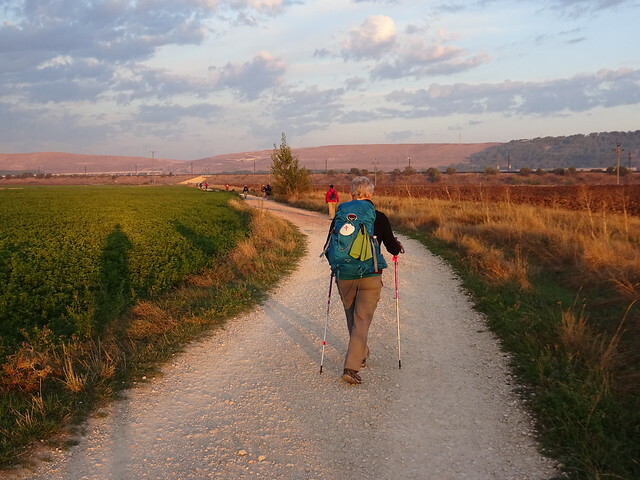 By early afternoon we were in a Camino rush hour heading towards Hornillos del Camino. Since there are limited facilities in that little village, we were worried that we might not find a place to stay. In the late afternoon some peregrinos were wandering around outside still wearing their backpacks. Maybe they were out of luck for finding a place to sleep. Later we learned that the municipal albergue has, in addition to 32 beds, 14 beds in the adjacent town hall and overflow space available on mattresses in the large sports hall. There are several other albergues as well, including the new one where we are staying: The Meeting Place. It’s amazing that a town of only 100 people can provide for as many peregrinos as they do. 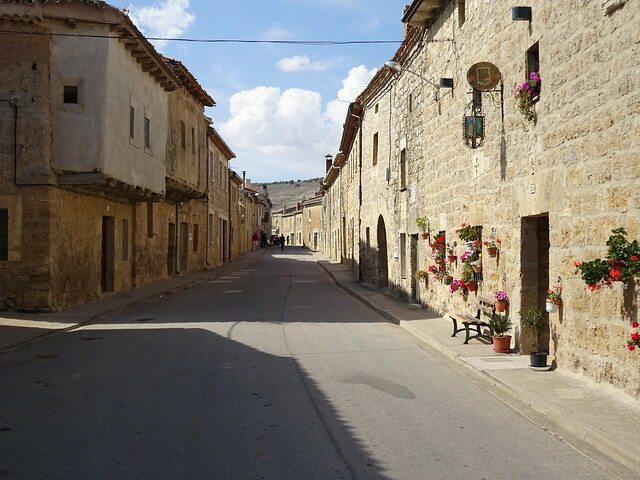 Little has changed over the past centuries in Hornillos del Camino. The church occupies the dominant position which is typical of all classic pilgrim haults. All along the Meseta we will find the suffix “illos” appended to place names such as this. It has been suggested that this might have arisen due to a sense of the relative impermanence of man when experienced against the seemingly endless horizon under the vast vault of the Meseta sky. There is little to occupy a peregrino here other than chilling out and doing nada (nothing). That being said and, although there is limited wi-fi, everyone connects if they can to their various devices. Heads were down and fingers were busy texting. 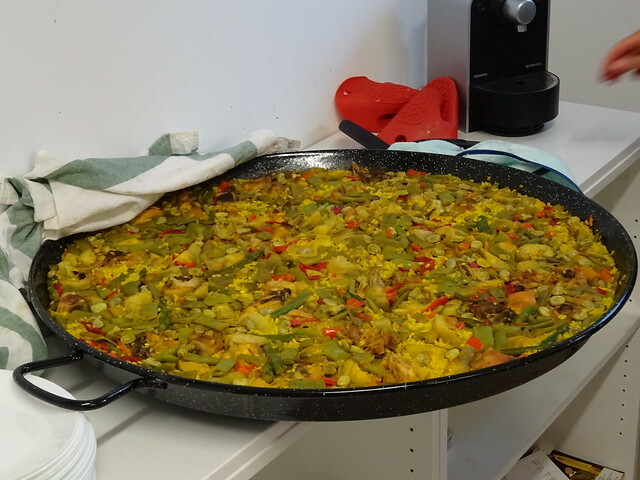 We shared a dormitory with 16 others and had a delicious community meal of paella. The cook was loudly applauded when he brought in the paella and once again after we thoroughly cleaned our plates. Hi Judy & Dave. Your adventures and photos continue to inspire us – not to mention the pic of freshly made Paella. I’ve been in touch with our neighbours who leave in a few days time to reacquaint themselves with the Camino. Hope you’ll cross paths on your respective journeys. I laughed out loud at the story of you two losing each other – shades of Gary and I whenever we travel together. Wish Linda and Randy a “Buen Camino!” from us.